Distributor: R1 DVD box from FUNimation. Also Recommended: Scrapped Princess, Record of Lodoss Wars, Elemental Gelade, Utawarerumono.... and still trying out the original arcade game. Notes: Loosely based on the Tower of Druaga game series, most notably the original Tower of Druaga and, to some (unknown) extent, The Tower of Druaga: the Recovery of BABYLIM. 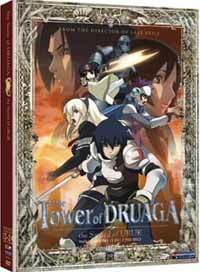 Six months after Jil and his friends had conquered Druaga in the tower, only to be betrayed by his brother, he and Fatina try to move on with their lives. To make matters worse, king Gilgamesh had taken credit for Druaga's defeat, which left Jil finding little joy in the peace that reigns all over Meskia. So when Jil and Fatina encounters a little girl named Kai, who requests them to take her to the top of the tower, Jil eyes the chance for more adventure, but also the chance to find some answers to the events that took place six months ago and those that transpired in its wake. Those of you who read my review of Tower of Druaga: the Aegis of Uruk or saw it yourselves probably remember that the show was a few floors short of a full tower, both literally and metaphorically. The opening episode in particular was like a full blown night on the town, with liberal amounts of alcohol, drugs and red paint. (More metaphorically than literally this time.) And while I felt the show was a little short on plot points, it was a generally entertaining watch. But if the Aegis of Uruk was the big, no-holes-barred, full blown party, the start of the Sword of Uruk definitely felt like the morning after. Fatina had taken a job as a tour guide and souvenir saleswoman, while Jil, having taken the betrayal of the kingdom much harder, spent most of his time sleeping his days away. It was a rather sobering contrast to the stark raving madness of the first show, to say the least. The show still look pretty damn nice too. Character designs are as good as ever, as is the background art, in particular the random worlds our main party is traversing. The music is also pretty good, adding a lot of atmosphere to the show itself, not to mention a... well, fairly decent general rock opening theme, I guess, once again showcasing the cast in a modern setting to go with the animation. But more than anything, I just want to say... about damn time! When I went through the Aegis of Uruk, I lamented the lack of any actual explanations on what was going on. The Sword of Uruk actually explains all this. We learn what went on with Gilgamesh before he became king. We learned what Neeba wanted when he took Kaaya and left the others behind. Recommended Audience: Like the first season, the Sword of Druaga has your average amount of typical RPG violence. Nothing too bloodied, really, but between that and the various amounts of fanservice (the ladies like their baths), I think it's safe to say that it's made for teenagers. Tower of Druaga: the Sword of Uruk © 2009 Gonzo, Bandai Namco Games.